First dry fit of the filers' room floor. As usual with this kit, the fit is perfect. The rails around the openings and the staircase need to be built and installed before this floor is glued in place. As I have no intention of interior detailing, I played with the idea of not building the staircase. But, what the heck! I have, and paid for, all the parts. So it will be going in. 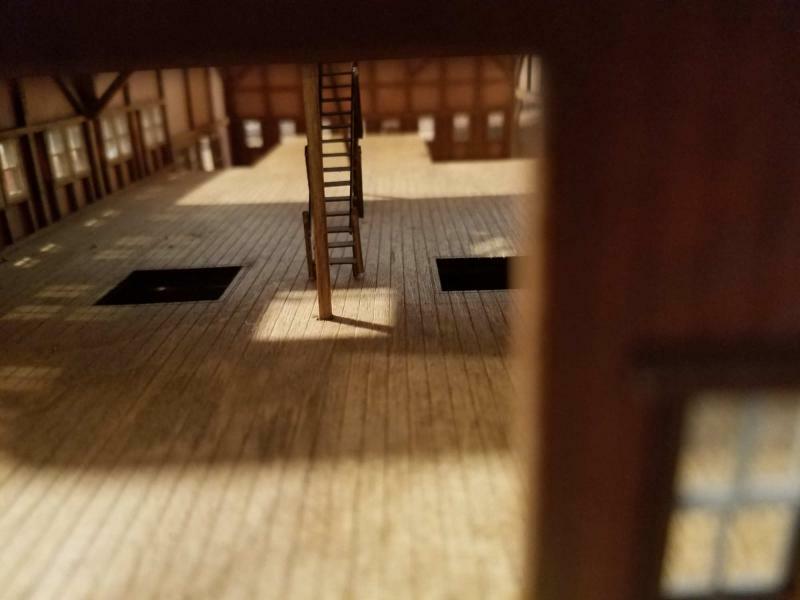 Here are the last windows I scratch built. I think around 2009. The medium is styrene. Here is a photo of the entire depot. 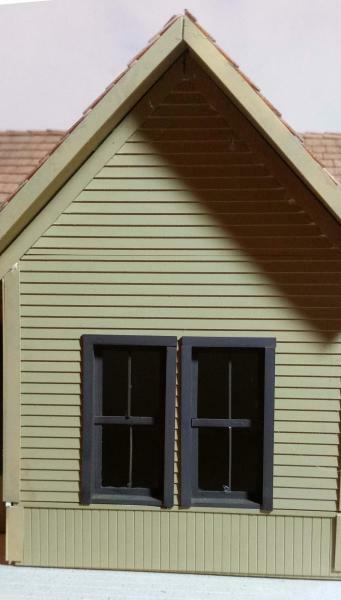 It is all styrene except for the shingles. This was on my previous On30 layout. 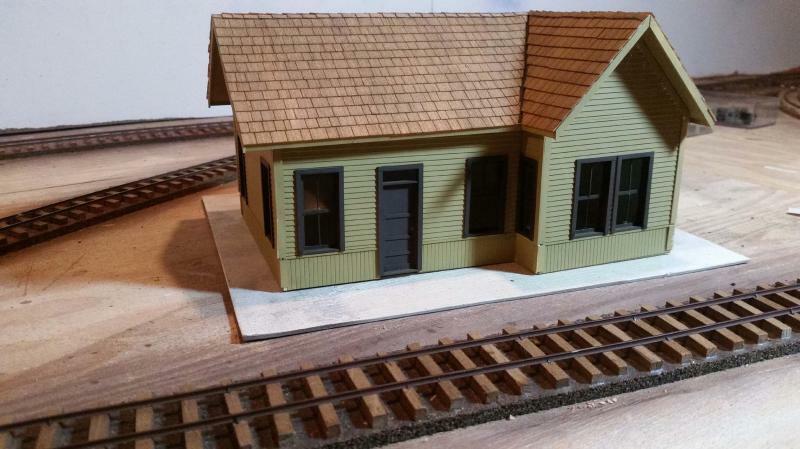 The plans came from an ancient edition of either Model Railroader or Railroad Model Craftsman. I never did get around to building the platform. Maybe on the next layout. Here is the first laser kit that I built. 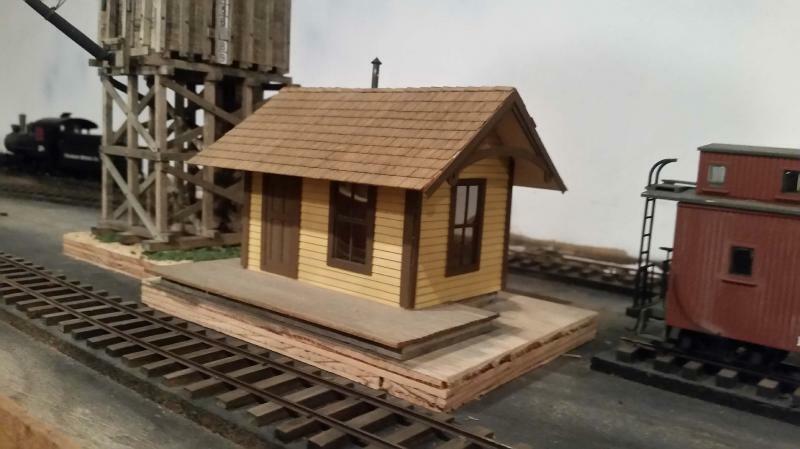 It is a dandy little depot in 1/4" scale. I would recommend this kit to a first-timer. it took me about two hours to put this together, not including the shingles. The shingles did not come with the kit. I would recommend planning more time if this were my first somewhat craftsman kit. The laser kits are kind of in between the high end plastic kits and true craftsman kits. Now the water tank in the background is a different story. It is a great kit ((I would have to look up the company name. Dave Rigmaier (sp?) at Oso Publishing is the force behind it) but not a beginner's project. I spent several weeks of evenings and weekends to wrap up that one up. The hand rails are in place around the openings in the filers' room floor. after an unfortunate incident with a trestle project. However, I couldn't think of another alternative to getting these hand rails in place. They are very small and there is no way to clamp them. 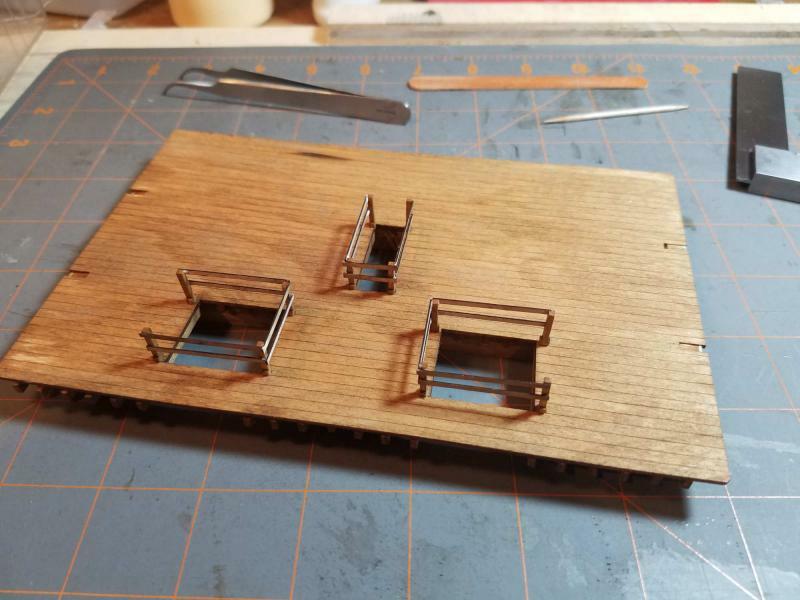 If I had been scratch building, I would have built the hand rails up flat on the bench. But with the way the posts are fitted to the floor, that option was not available for the kit. The posts had to be installed in the floor, and then the rails attached. Since these are interior details with no real stress applied I am quite comfortable with the Aleen's. 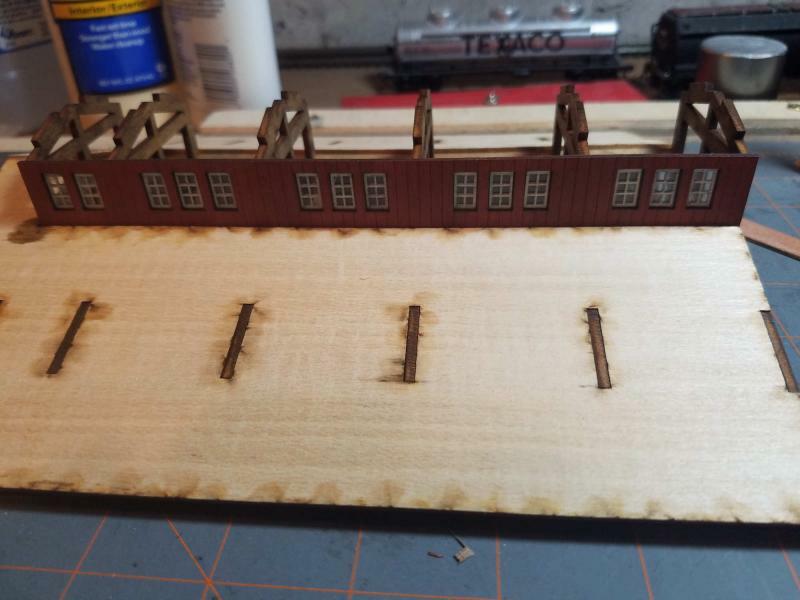 In case you missed it, for my On30 layout that preceded this one, I built a timber trestle. It was assembled with Aleen's Tacky Glue. The work can go really fast because you don't need to wait for glue to dry as often. The Aleen's is not the least bit moisture resistant, ever. A plumbing disaster in my basement completely destroyed the trestle. The Aleen's works really well when assembling very small parts that are difficult to jig or clamp. Just bear in mind that any moisture at all and the parts will come unglued. I also started work on the stairs that go from the main floor up to the filer's room. These parts are REALLY small. And light. Trying to keep parts this small lined up while getting them glued is a challenge. BTS recommends starting with just two treads, which is a very good idea. I kept thinking how much easier this would be in 1/4" scale. 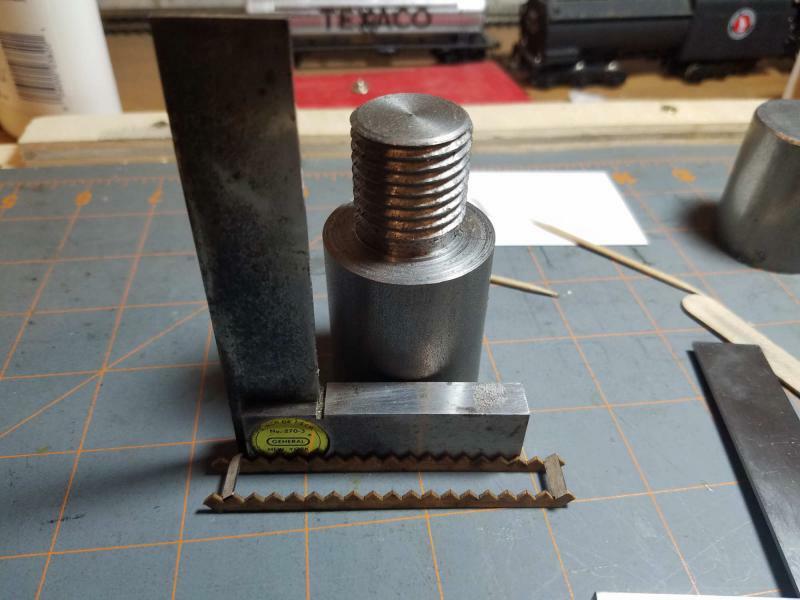 The machine shop scrap box is a great source for weights. 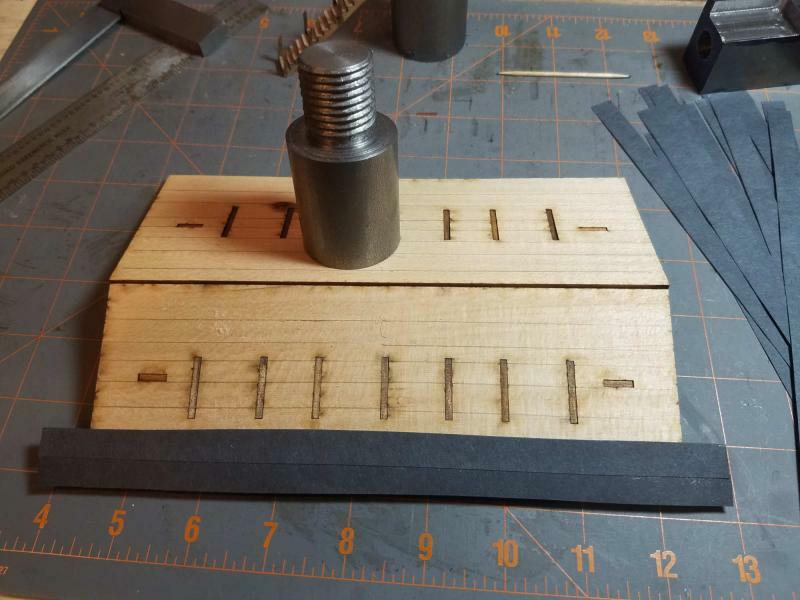 In my machine shop projects I don't think there is a single part that I managed to get right on the first try. This weight was the beginnings of an adapter for a friend's wood lathe. The outside threads worked OK. But I botched the inside threads. In hindsight, I should have built a jig for the stairs. It would have been a bit easier and a lot more accurate. I believe I will do that for the rest of the stairs in the project. Doing some machine work teaches a lot about jigs and set ups. It is not unusual to spend a couple of hours doing the set up for a five second cut. 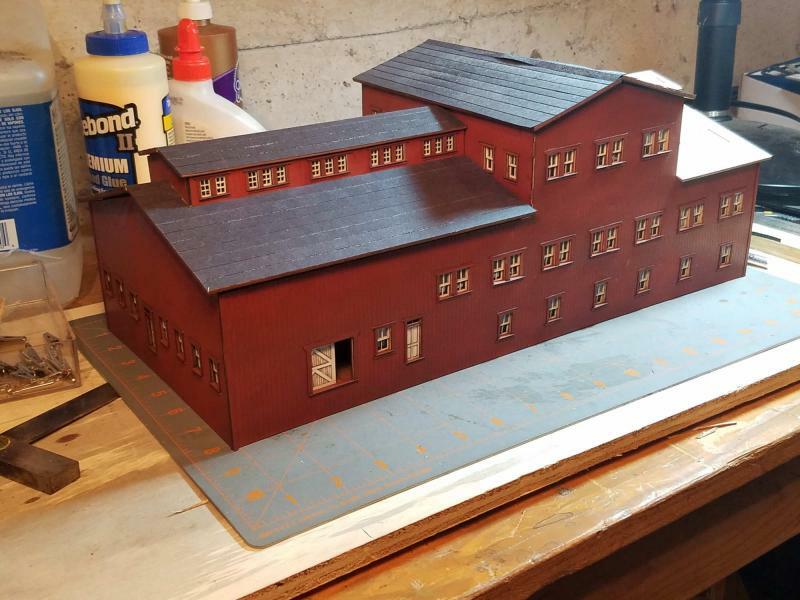 I am learning to transfer that mind set over to my other model building. since they are an interior detail and I have no intention of detailing the interior. But my Scots heritage kicked in. I paid for the parts, I am going to install the parts!!
" I feel the need for model-building rant Number 3. I recently fielded the often heard comment "I would never have the patience to do that". No. You don't have the motivation. It is not my experience that some people are born more patient than others. Well, maybe a little. But my experience is that patience is a learned skill, just like all the other skills necessary for any creative process. I am no NMRA master builder. I have built a lot of kits and scratch built quite a few models, and with good results. But I do not exercise the patience to create competition level models. I have a reputation as being a patient person. I attribute that to having started building models at a very young age. 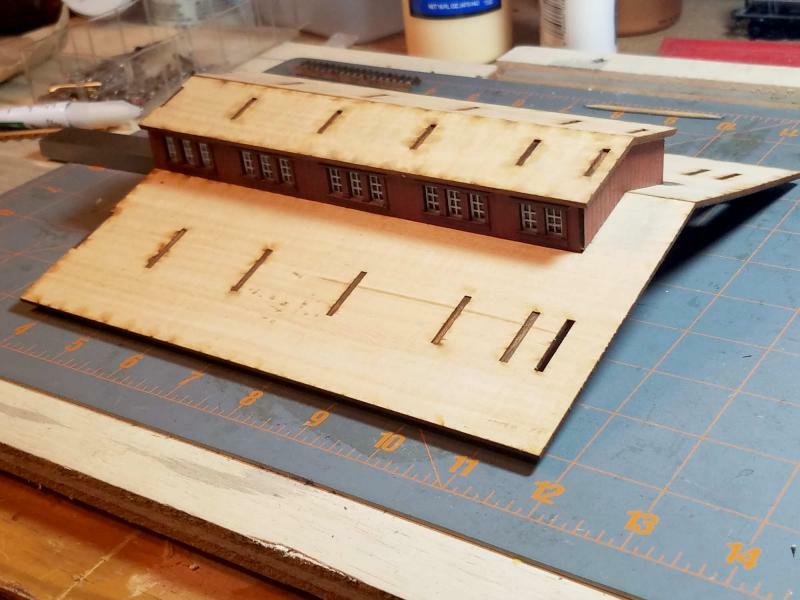 In model building, you either learn patience or you fail. And if you are sufficiently motivated, you will learn patience. The biggest element is the motivation. among which is patience, to complete respectable models. The level of motivation will determine the level of modeling quality that any one builder can achieve. 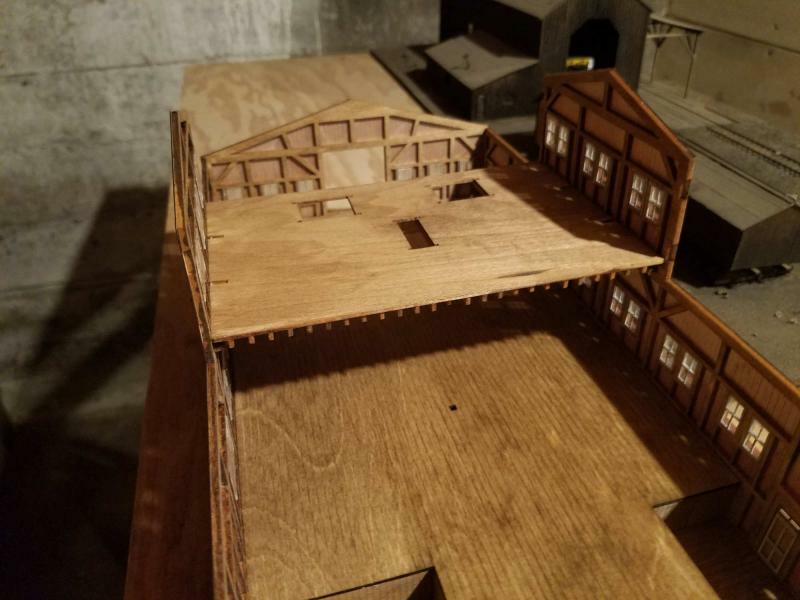 First of all Reg, I am really enjoying seeing your mill come together ! I don't think what you said quoted above ^^ is a "rant" at all. I guess you were sorta joking anyways ! I'm an incredibly PATIENT person, as you said, most modellers need to be in one way or another. But from time to time, as do we all, I lack a bit of MOTIVATION. Also, even despite patience AND motivation, one can simply get 'stuck' on construction decisions, as I often do. ... but at the same time, be FULLY involved in actually BUILDING a very unique model. Yes, the use of the word "rant" was in jest. I would hope that neophyte modelers would check into this part of the forum as a means of gaining inspiration. and I can produce credible results, if not quite competition level. but also to let beginners know that they, too, can build models of which they can be proud. I know that in my early days there were individuals and publications that inspired me and instructed me. and the publications, for the most part, reflect a tendency towards more ready to run products. required some work to be credible models. I remember fabricating HO scale windshield wipers out of tiny bits of wire for my Athearn SD-40-2's. So that is why I will sound off on occasion. It is also why I am posting so much detail on the construction of this mill. The mill continues to march along. and often construction consists of 20 minutes of work and then a 24 hour layover while glue dries. I got to the point of dry-fitting the filer room walls and floor. There was a little bit of trimming that needed to be done to the walls. The sheathing was hanging up on the main walls and preventing the tabs and slots from matching up. A little carving with the X-acto knife fixed that. After this photo was taken the floor and one wall were removed and the remaining wall glued in place. I will not glue the second wall in place until the stairs are installed. 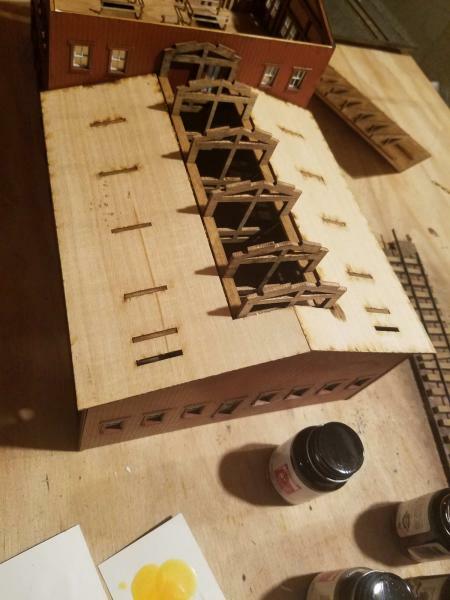 I also dry-fit the roof and learned that the floor will need some fitting. 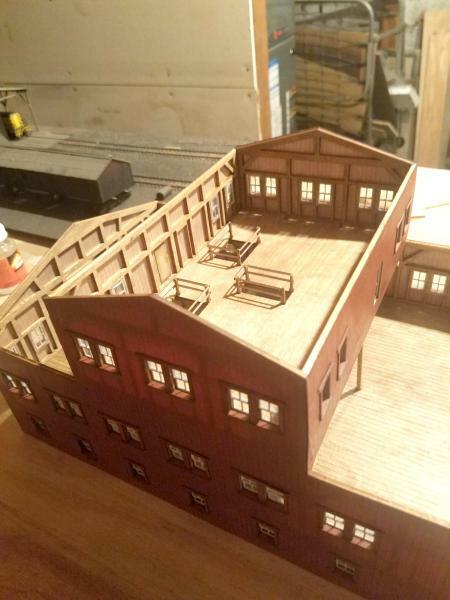 The main roof has been assembled, after much dry fitting, and dry-fit on the building. Along those lines, I have been waxing poetic about parts fitment. Not so much the clerestory. This is the first dry-fit of some of the clerestory parts. If you look closely you can see that the walls extend above the edge of the rafters. The gable end had the same problem. and no discussion of how this problem might arise and what to do to fix it. The parts for this assembly do not fit well. The roof could not be installed in full contact with the rafters without adjusting the wall and gable end heights. and VERY CAREFULLY, sanded off about 3/32 from the bottom of the walls and the top of the gable end. While the belt sander was fast, it was not without its drawbacks. I took several small cuts, rather than trying to get it right with one cut. My model shop is in the basement, my machine shop, wherein resides the belt sander, is in the garage. My old knees were complaining about the repeated trips up and down the stairs before I got the fit where I liked it. The other drawback is that, while the basement is a comfortable temperature, the garage is 29 degrees. 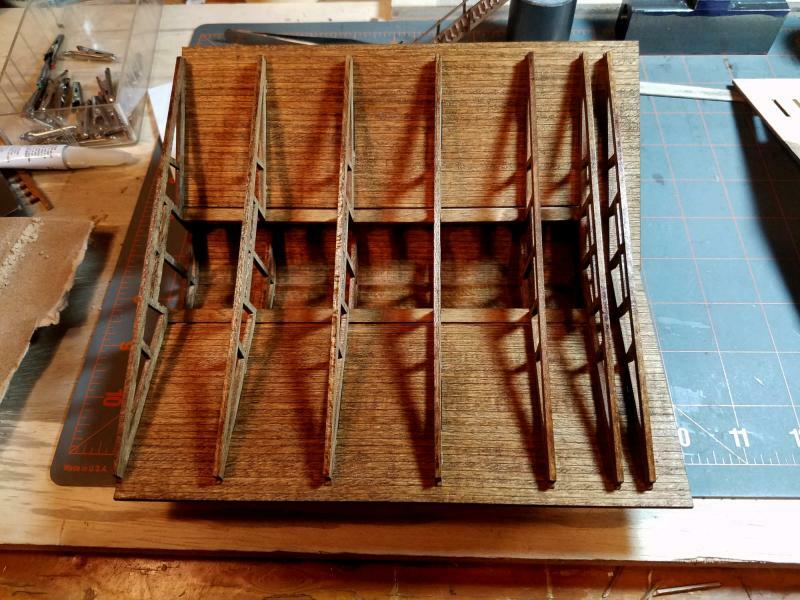 Finally I was able to dry-fit all the parts for the clerestory. I used the belt sander to put the 15 degree chamfer on the roof pieces where they join at the peak. That could be done with sand paper or an emery board. The belt sander is a lot faster, but requires a light touch. The stairs are finished except for the handrails. I had a small adventure with the stairs. The instructions call for sanding the edges of the treads flush with the risers. I first attempted to do that with a piece of sand paper taped to a flat service. Which resulted in several treads coming unglued. So I trimmed individual treads with the emery board, after gluing the escapees back in place. And that is the progress to date. There is a small point about the instructions that one needs to keep in mind. In the introduction, Bill warns that repeat processes will only be addressed once in the instructions. he does not get around to mentioning the chamfer that needs to go on where the roof halves meet until about the third assembly. A good reason to thoroughly read through all instructions before starting assembly. Having said that, I missed this requirement, but did the chamfers anyway, as it was obvious they were necessary. The filer room floor and walls are glued in place. I am still working on the stairs. They can be installed from underneath the filer room floor. The handrails are very fussy, as they are very, very small parts. I started on the roofing. The weight keeps things from skittering across the workbench when pressure is applied. These roofs end up being very light. I drew random parallel lines in order to keep things somewhat straight. So far this has gone very well. I have completed the filer room roof. It is not quite ready for a photo. I used spray adhesive, so my fingers are a little sticky. The instructions say to lay down a thin layer of glue. When I got this roof done, the paper seemed to have a bit of shine to it. So I hit it with some dull coat. Here is what the inside of the roofs looks like. I will certainly keep the roofs removable. The stairs got finished and installed. These things are really tiny. It took quite awhile to dry fit and final fit these stairs. 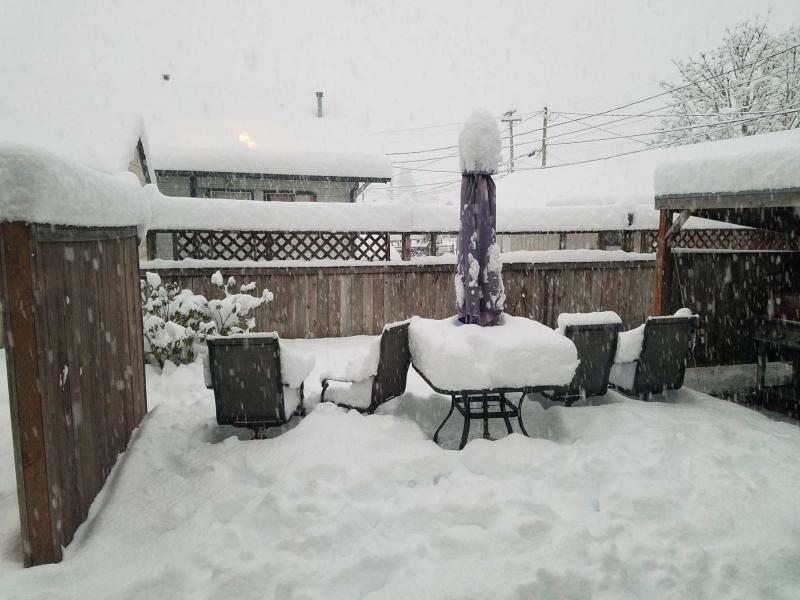 We simply do not get this much snow. Nor are we prepared for it. One more bit of roof to "tar paper". Not only are there a lot of windows in this structure, there is a lot of roof, too. There is a lot of detail work that needs to be done here. And the log chain and the platforms are major projects. One of the details is fixing that bit of "tar paper" that is sticking up. There is also corner trim on the filer room, door knobs, and other bits and pieces.